There is nothing praiseworthy in opposing the violation of the privacy of powerful world leaders while ignoring the rights of millions of ordinary citizens. Of all the spying activities conducted by the National Security Agency and disclosed by Edward Snowden, the one provoking the most alarm in Washington is the revelation that the agency monitored the communications of at least thirty-five world leaders, including Angela Merkel. Suddenly there is concern that the agency has overstepped its authority regarding foreign dignitaries—but not necessarily when it comes to American citizens. After an outcry from Europe, the Obama administration indicated it may order the NSA to stop monitoring the heads of American allies. Senator Dianne Feinstein, the chair of the Senate Intelligence Committee and a prominent defender of domestic surveillance, said in a statement that Congress was not “satisfactorily informed” about the program. “With respect to NSA collection of intelligence on leaders of US allies…I am totally opposed,” she declared. The California Democrat said she will oversee “a total review” of “all intelligence collection programs,” which could be a watershed moment not only for the NSA, which faced little public scrutiny prior to the release of the documents obtained by Edward Snowden, but also for the entire intelligence community, including the CIA, the FBI and the Defense Intelligence Agency. The sudden crack in Feinstein’s defense of the NSA is certainly noteworthy. However, declaring that “Feinstein Pulls the Rug Out From Under the NSA,” that she “Shivved the Spies” and is suddenly “off the NSA bus” perhaps overstates the impact of fallout from foreign spying. Ordering the NSA to stop eavesdropping on world leaders and rolling back the mass collection of communication records from millions of Americans represent different directives. It’s far from clear that Feinstein’s review will lead to the latter, or that it will thoroughly probe other domestic surveillance activities that have only been hinted at. Feinstein went ahead with a markup of her own NSA reform bill yesterday, which would allow the agency to continue to vacuum up Americans’ call records indefinitely. Meanwhile, sympathetic lawmakers led by House Intelligence Committee chairman Mike Rogers lobbed softballs at NSA director Keith Alexander and National Intelligence director James Clapper during a hearing. Questioning did little to investigate the effectiveness of dragnet surveillance or to challenge officials’ assertion that “inaccurate reporting” is the essential concern. Eavesdropping on Merkel and thirty-four other world leaders says plenty about the NSA’s disregard for the foreign policy implications of its actions. But it is not particularly surprising that the agency gathers information on foreign leaders, particularly since the NSA’s authority is for conducting foreign intelligence operations. Domestic surveillance programs, on the other hand, present a real threat to the civil rights of millions of Americans, and have the potential to dramatically refashion the relationship between the state and its citizens. This is the kind of activity that warrants congressional investigation, and official condemnation. There is nothing praiseworthy in opposing the violation of the privacy of powerful world leaders while ignoring the rights of millions of ordinary citizens. 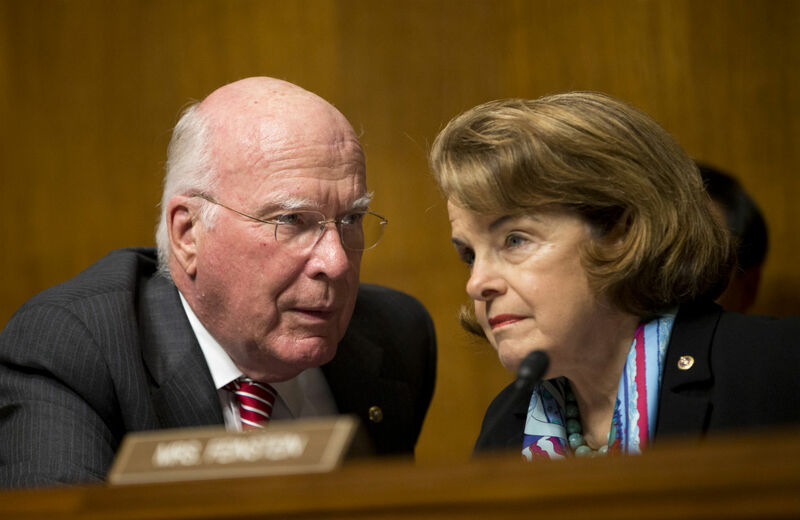 Legislation introduced Tuesday in the House by James Sensenbrenner and in the Senate by Patrick Leahy would end the phone records program under section 215 of the Patriot Act. “The government has not made a compelling case that this program is an effective counterterrorism tool, especially when balanced against the intrusion on Americans’ privacy,” Leahy said in a statement. The legislation, which has seventy co-sponsors in the House and a sixteen in the Senate, would also limit the collection of Internet data under the FISA Amendments Act, institute a civil liberties advocates on the Foreign Intelligence Services Court and require public release of significant court decision and new inspector general audits. Is the NSA spying on President Obama? asks William Greider.